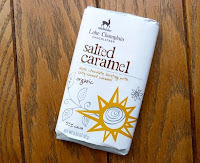 Today's organic Salted Caramel bar broke apart into eight domed squares with a sturdy snap. Pockets of fresh-tasting*, soft, salted caramel filling were securely contained inside each 55% cocoa dark chocolate square. And each square was marked with a stag, a suggestion of waves (lake), and 5 stars, all part of the Lake Champlain Chocolates (Burlington, VT) logo and origin story. The company has expanded the percentage of fair trade and organic chocolate over time. 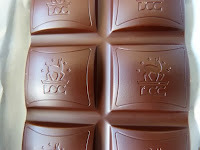 This bar contained organic and fair trade chocolate liquor, cocoa butter, sugar and vanilla. Today was Day #8 of Chocolate and Caramel Theme Week, and the beginning of Chocolate and Salt Week. Many of the best chocolate caramel bars now include a pinch of sea salt. More about this topic over the next several days. *Note: Freshness and proper storage (at proper temperature) significantly affects both chocolate and caramel. Over time, and/or if stored improperly, a silky caramel can become stiff, lifeless and even chalky. 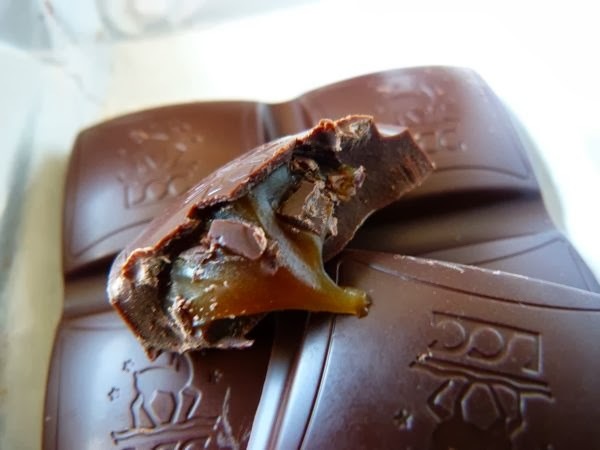 And chocolate can become brittle, bloomed, or lose flavor notes. It's easier to prevent problems like this in the cooler months like December, but things can still go wrong in transit. So, a bit thank you to chocolatier and distributor/retailer for ensuring a fresh product.